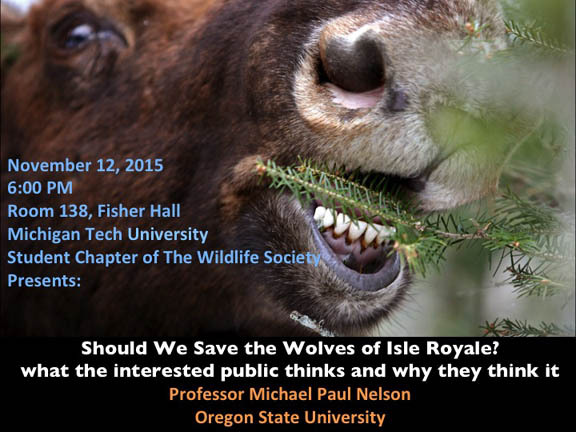 HOUGHTON -- Michigan Tech's Student Chapter of The Wildlife Society will present "Should We Save the Wolves of Isle Royale? What the interested public thinks and why they think it" by Michael Paul Nelson, professor at Oregon State University, at 6 p.m. Thursday, Nov. 12, in Room 138 of Fisher Hall at Michigan Tech. In addition to publishing many essays and articles, Nelson is the co-author or co-editor of four books, including MORAL GROUND: Ethical Action for a Planet in Peril, which he co-edited with Kathleen Dean Moore. That book was the subject of a discussion on "What do we owe the future?" led by Nelson at Portage Lake District Library in 2010. At Oregon State, Nelson is a professor of environmental philosophy and ethics and holds the Ruth H. Spaniol Chair of Renewable Resources. He serves as the Lead Principal Investigator for the HJ Andrews Experimental Forest Long-Term Ecological Research program. Nelson is called upon regularly by various government agencies and conservation organizations to assist with understanding the ethical implications of natural resource management decisions. * For background, click here to read our Aug. 25, 2015, article, "Public comments on Isle Royale Moose-Wolf-Vegetation Management Plan/EIS due Aug. 29; wildlife experts concerned about wolf rescue," concerning the July 27, 2015, Open House seeking public input on the proposed Moose-Wolf-Vegetation Management Plan and Environmental Impact Statement (plan/EIS) for Isle Royale National Park. ** Click here to read about the Conservation Ethics Group.